(Bloomberg) -- Move over Singapore — the world's most expensive city has two new rivals. 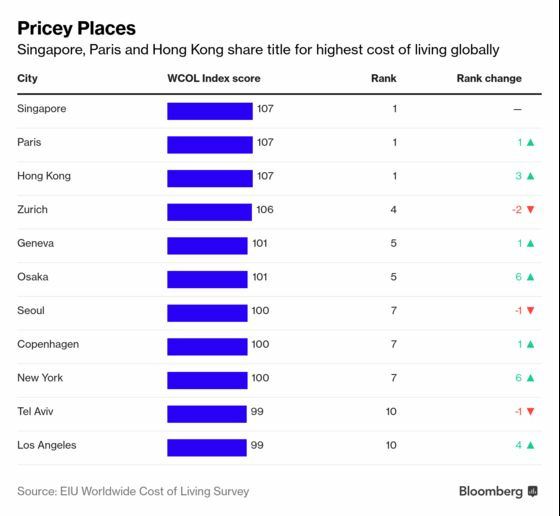 After topping the Economist Intelligence Unit's Worldwide Cost of Living Survey for five years, Asia's Lion City has been joined by Paris and Hong Kong in a tie at the top of the table. Zurich and Geneva rounded out the top five, while New York and Los Angeles reclaimed spots in the top 10 — ranking in seventh and 10th respectively — after slipping to 13th and 14th last year thanks to a weakening dollar. The survey is designed to help companies calculate cost-of-living allowances and build compensation packages for expatriates and business travelers. The trio of cities sharing the top spot are 7 percent more expensive to live in than New York, according to the EIU, which compiles its list from a survey of 160 products and services across 93 countries. The Japanese port city of Osaka was another re-entry, moving up six spots to number five. Seoul (joint seventh place), Copenhagen (also seventh) and Tel Aviv (10th) round out the top 10 — which actually consists of 11 cities thanks to tied places. "Weaker local currencies have pushed all five Australian and two New Zealand cities surveyed down in the ranking," the EIU said, accounting for Sydney's absence after it scraped into 10th position in last year's report. Outside the top 10, the EIU said the cost of living in Chinese cities remains relatively stable, while Southeast Asian destinations were moving up the ranks. One of the factors behind Asia's strong showing at the top of the table is that some Asian cities are among the world's priciest locations for general grocery shopping, according to the EIU. But while parts of Asia remain the most expensive places on Earth, the continent also makes several appearances at the bottom of the list. "Within Asia, the best value for money has traditionally been offered by South Asian cities, particularly those in India and Pakistan," the EIU said. "To an extent this remains true, and Bangalore, Chennai, New Delhi and Karachi feature among the 10 cheapest locations surveyed."